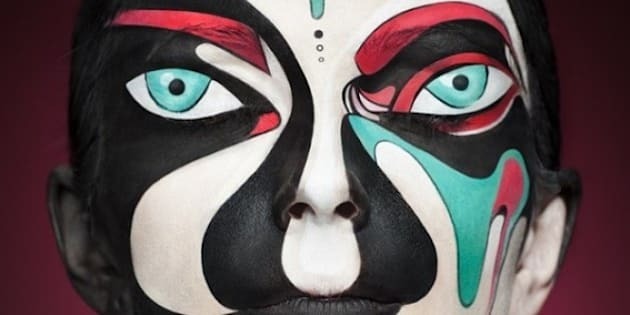 "2D or not 2D," that is not the question, but the title of a new collaborative project between a makeup-artist and a photographer who created a cool makeup transformation photo series. Russian photographer Alexander Khokhlov and artist Valeriya Kutsan, along with assistant Veronica Ershova, transformed models' faces into 2D images that were molded after iconic sketch, graphic, watercolour and oil painting artists such as Lichtenstein, Basquiat, and Mondrian. The collaborators used different techniques to create the 2D illiusion: Kutsah used makeup techniques to make the models' faces look flat, while Khokhlov enhanced the features by choosing specific angles to shoot the photos and Ershova assisted in retouching and post-production.